LAS VEGAS – Sept. 20, 2017 – Barrett-Jackson is kicking its 10th Annual Las Vegas Auction into high gear with a docket filled with custom, professionally restored and original Chevrolet cars and trucks. Held Oct. 19-21, 2017,at the Mandalay Bay Resort and Casino, the Las Vegas Auction’s incredible docket of Chevrolets includes a’64 Corvette Custom Coupe (Lot #724) that features a custom-built split window, an original’70 Chevelle LS6 (Lot #738) finished in rare Astro Blue code 25, and a professionally built ’50 3100 Custom Pickup (Lot #720). 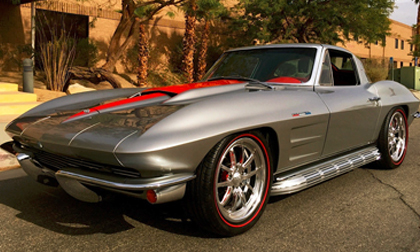 A hotly anticipated Chevrolet is a ’64 Corvette Custom Coupe (Lot #724) featuring a custom-built split window. It is powered by a high-performance 427ci V8 engine with Weber-style billet short-stack EFI and a 5-speed Tremec manual transmission. Original Chevrolets, including a ’70 Chevelle LS6 (Lot #738), are also lending their star power to this year’s Las Vegas Auction. Finished in rare Astro Blue code 25, this Chevelle features a documented matching-numbers LS6 454/450hp engine with its factory-original M22 4-speed manual transmission and original CRW 4.10 posi-traction rear end. A ’50 3100 Custom 5-Window Pickup (Lot #720) has all of the custom bells and whistles inside and out. The 406ci small-block engine has a dress-up kit, while the interior boasts Relicate leather, power windows, Dakota Digital gauges and Lokar shifter, among many other upgrades. The 2017 Las Vegas Auction Preview Docket is available to view online. Click here to consign a vehicle or visit Barrett-Jackson.com/Bid for information on becoming a bidder. Advance tickets and all-week ticket packages are also available at Barrett-Jackson.com. Established in 1971 and headquartered in Scottsdale, Arizona, Barrett-Jackson, The World’s Greatest Collector Car Auctions®, is the leader in collector car and automotive lifestyle events, which include authentic automobilia auctions. The company produces auctions in Scottsdale, Arizona; Palm Beach, Florida; at Mohegan Sun in Connecticut;and Las Vegas, Nevada. With broadcast partners Velocity and Discovery Channel, Barrett-Jackson features extensive live television coverage, including broadcasts in over 100 countries internationally. Barrett-Jackson also endorses a one-of-a-kind collector car insurance for collector vehicles and other valued belongings. For more information about Barrett-Jackson, visit Barrett-Jackson.com or call 480-421-6694.